I began glider school based on the belief that learning to fly without power would make me a better powered-pilot. 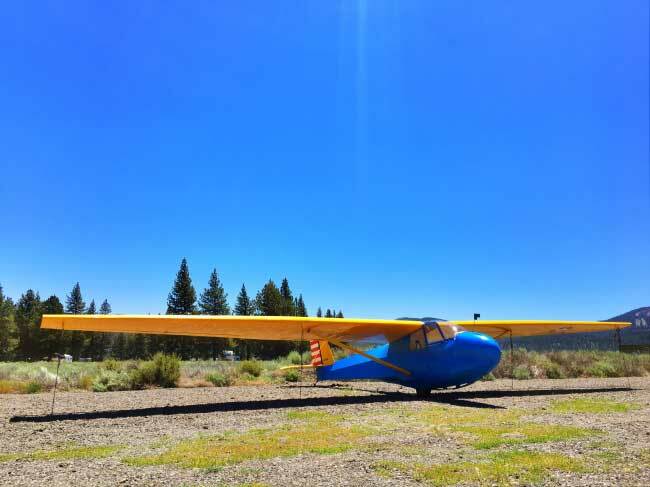 I base out of Truckee, California, and there happens to be a rather renowned glider school at the airport. 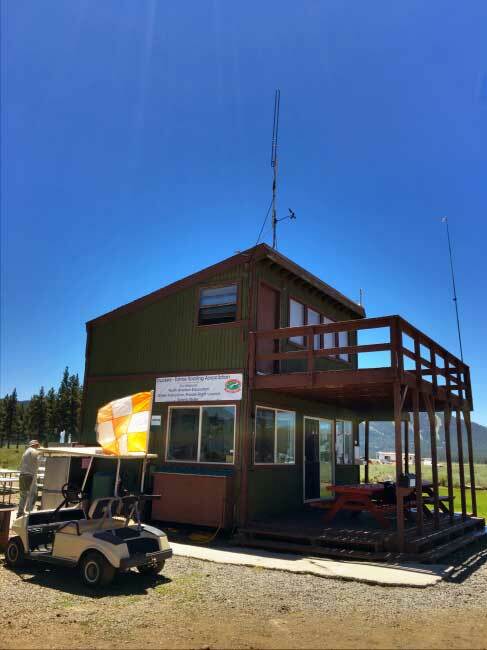 They operate from May to October and are a premier location in the world to fly gliders or “Soar” largely due to the incredible winds created by the mountains. The Sierra Nevadas are a neat place to be a VFR pilot. Winds are always present past 10:am and get pretty dramatic by the afternoons, especially in the summer. It’s often an uncomfortable flight coming in and out of the area as mountain waves, rotors, and ridgeline winds toss you and your aircraft about. I flew north and identified a small high elevation pass that was not big and quite narrow with much less elevation change from one side of the pass to the other. Thinking of the winds like I would water coming over the mountains and falling into the valley, I estimated that the cooler heavier air up beyond that pass would spill through the pass in a fast moving but steady fashion. So I aimed the airplane at that little pass and sure enough, my groundspeed dropped from 120 kts to about 72 kts as I approached. I descended and turned toward one side of the pass (the peak to the north) to give myself better positioning to turn into descending terrain, if need be, and felt the right wing dip as I got near. This was expected and so now I kinda knew my limits on that side of the pass and stayed in the main stream of flowing air. On the other side of the pass is a big valley and as soon as I entered that valley the air felt completely stable. No signs or clues that just south of me on the ridge 50+kt winds were pouring like a waterfall down into the valleys bellow. It’s a thrilling experience for a pilot to go into a situation like that, apply what you have been taught and be right! It’s validating and affirming when the skills you have been taught see you safely home. When the wheels touched down that day I was still on cloud 9! Which, of course, made me incredibly chatty about it to my passenger, who didn’t give a crap. It’s such a common experience up here to do battle with what feels like a sudden, strong downdraft and/or gusts of wind hitting you from the side and blowing you off centerline on low approach when the windsock is completely limp. It’s just how the Sierras are. From what I have been told this windy environment is what makes the area great for Soaring. In my mind, that translates to a glider pilot having a better understanding of how the winds are behaving in their respective environment and how to use those attributes to the aircraft’s advantage. I have a deep desire to become more comfortable with flying in the conditions mountain flying presents. I have received mountain flying training and that went a LONG way to building the skills I desire however I couldn’t help but notice that, as all the powered pilots landed and put their aircraft away before the afternoon winds got too bad, the glider pilots all were all taking off and flying excitedly into these dramatic winds. So when I went over to the Glider school I was on a mission. I heard that these pilots learn to read the terrain in a way a powered pilot never even thought of. They look for exposed rocky patches and “dip a wing into an updraft” using it to climb 2, 4, 10,000 feet higher into the air. So cool. In my mind, a glider rating was the door to being able to see the invisible and ultimately become a super pilot. This year I was going to get that rating and become one of those pilots. Pulling up to the Soar Truckee building in my truck I felt the usual anti-social anxiety I always feel building in my gut when confronted with just about any other human being. I hate looking like an idiot, although I have reconciled myself to that inevitable fate. The building is small with a wooden plank deck and sliding glass doors leading to one room (that I could see) and as usual, for airplane places, had airplane people sitting out front enjoying hangar talk and sunshine. Why is this situation so terrifying for me? I was raised by a good man who taught me that to interrupt adults or make a fool of yourself was deserving of a sharp smack to the back of the head. Manners you see, very important. So with my social anxiety peaking, I walk up to these men and politely (if I do say so myself) interrupted, “Excuse me, I’m looking for someone who can teach me to fly a glider“. The gentlemen all turned. A grey haired man stepped forward and with a thick Dutch accent asked “Have you ever been soaring before?” I was not familiar with the term soaring and with his accent being SO thick I just stared at him running the noise he made by all possible words I knew. Drawing a blank I simply said, “no?”. With the basic term soaring confirmed, I was able to announce my grandiose mission with some expectation that these fine pilots would be impressed with my deductive reasoning. I launched into the description of my mission and why I was there being sure to use enough Pilot-like terms and phrases as to give away my knowledge and skills as a powered pilot. I was confronted almost immediately by the all to0 familiar stare of people who actually know what I am trying to talk about, and are trying to carefully choose words that don’t make me feel as idiotic as I just sounded. First thing learned/remembered: a pilots #1 weapon against embarrassing accidents is humility. I wasn’t off to a great start. 5: Have passed the flight exam with an FAA Examiner. Because I was already a Private Pilot I would basically have to get an estimated 10-15 flights and pass the flight test to acquire the rating. Now, one might assume that these flight lessons would be less painful on your pocketbook than lessons for your powered certification. That proved false. You rent a glider, you rent a CFIG, you also rent a tow plane and a tow pilot, and although there is no fuel in the glider, there is in the tow plane and you pay for that too. As you know fuel burn is at it’s highest during takeoff and climb out and you are not being towed by an inexpensive C172, so fuel burn is substantial. I did four flights during my first, 1-hour lesson and the total was just shy of $400. Ouch! Not wanting to relearn lesson #1, I shut my mouth and agreed. As we walked over to the parking area my CFIG explained the aircraft we would be soaring in was a Schweizer SGS 2-33 a two seat, high-wing, training glider. It’s a fabric covered airframe with a fiberglass nose. With some help from some of the crew at the glider school, we pulled the aircraft out of parking and hand pulled it over to a sort of staging area where it was hooked up to the Tow Plane. The Tow plane was a white 1965 Piper PA-25 a single seat 250 hp piston airplane that has some interesting support struts coming from the wing to the fuselage. I’m not terribly familiar with this airplane or why it makes for a good tow plane… maybe someone in the comments can fill in that gap for me. The canopy on the Glider opens up with a small metal latch and you climb into the front seat. The CFIG sits in the seat behind you. The Glider has a stick, not a yoke (love it), and instrumentation is pretty minimal. An airspeed indicator, altimeter, a transponder, and a radio make up the panel. There is a vent for air on the panel also and in a manner of speaking there is a turn coordinator… Not on the panel but actually on the outside of the aircraft attached to the pitot tube is a piece of orange yarn. When in flight if the yarn is slipping off center you add opposite rudder to bring her back to center. This is the opposite of the whole “step on the ball” so it can take a second to adjust to that but still pretty neat to use yarn to see if you are slipping or skidding and by how much. I was told that you don’t use a headset in a glider. In this glider we do which is fine but I was kinda looking forward to the idea of just having speakers in the cockpit and listening to the unobstructed sound of the rushing wind over the aircraft. Alas, perhaps down the road. Something odd was that I brought my own ANR headset and they insisted that I use their headset. No difference in the plugs, they just seemed to want me to use the old DC green rentals. Okay. The seatbelts were duel shoulder with a lap belt and really secure you in the seats, although not the most comfortable. There is a step to climb in and the helpers were still holding the wing. Oh, and on the panel is also a round ball. You pull on the ball to attach or release the tow rope. There is a lever to the left side of the front seat that operates the spoilers. Spoilers are like flaps except instead of increasing lift they simply spoil lift. When pulled back (in the direction of the rear of the aircraft) the last few inches active the wheel break. When this is first explained to you log it away as a vital part of the landing process, however, it turns out that you really should need the wheel break unless you land long or fast. The reason is that in this glider there is another “break”. 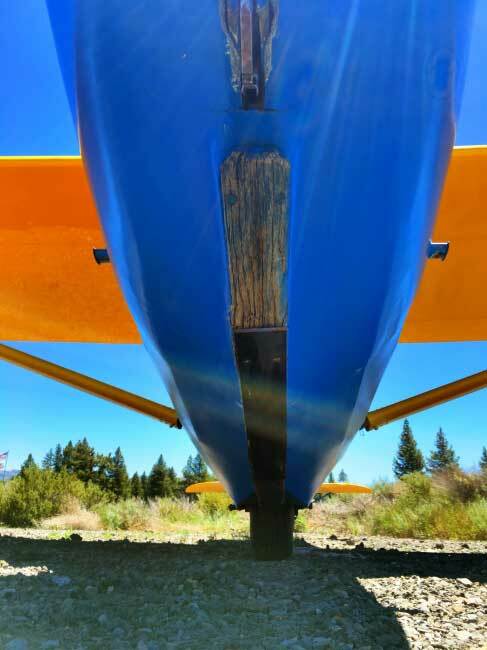 On the bottom of the nose of the glider is a strip of metal and wood, a kind of ski, if you will. As you land the weight is in the front of the glider and the nose comes down onto this ski grinding away on the runway which slows you down in a hurry. The experience is loud, uncomfortable, and unnerving. I have never landed a retractable without putting the gear down and I hope to never do so but if I ever am in a retractable and the gear are not lowered I now have some idea as to the noise and feeling that will follow. It takes a small army of people to launch one of these gliders and so there’s lots of activity around the aircraft while getting ready for take-off. The kid holding the wing up is watching you for hand signals through the glass and you are watching the kid hooking up the tow rope so you know when to open the tow hook with the ball. Initially, we were towed out onto the runway from the staging area by way of a golf cart. The idea is to pull the release at the right time to put the main wheel on the centerline. Once you do that the wing-kid turns the glider 90 degrees and lines it up. 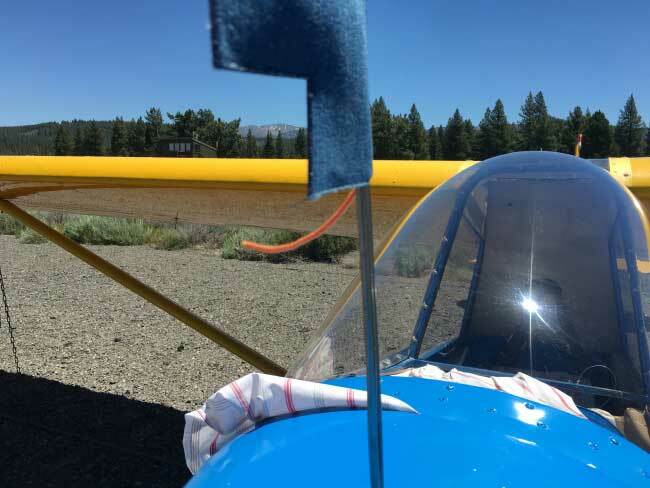 While this is going on you are doing a preflight checklist making sure your instruments, spoilers, flight controls, etc, all work and the tow rope kid is crawling under the nose of the glider to hook you up to the Tow plane, so watch for hand signals there. Once everything is set you make your radio call, identify as normal and add “Ready to Tow” and the tow plane starts to roll. This is where it gets real tricky because the rope tightens and the nose wants to come up. You react by pushing the stick forward and several moments after you expect some form of response from the flight control the nose goes down, then the instructor yells at you “No, no, no, keep the nose up.” You pull back and the nose goes to high again followed by a response from the instructor “Keep the nose level!” All this while using the rudder to keep the glider in line with the tow plane. After doing a few take offs you come to realize that when the tow plane starts to go the nose is going to come up, then dip down and pretty much self-correct in a matter of about 1.5 seconds. Just don’t let the nose drag or make the situation worse by pitching up when it bobs down a little. 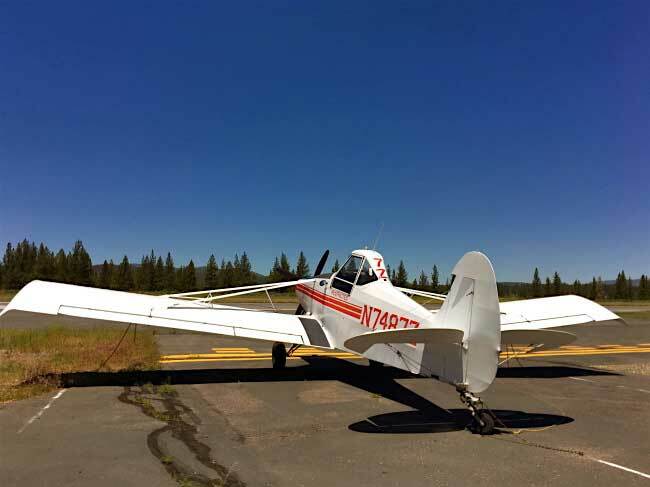 The Glider lifts off the ground before the tow plane and your job is to keep that tow plane right in your window, nice and level with your glider. Pretty easy to do now that you have some air moving over the control surfaces. As the tow plane rises and climbs you keep that plane right there level with you, you turn as much as he turns, and you climb or descend as much as he climbs or descends. You never want the tow rope to go slack or it could snap taught and break or worse. Now that all seems pretty easy until you think about doing this in turbulence, which is what we did, and what you will do a lot when gliding. The turbulence effects the glider in a way that is VERY different than, say, my C182. The PA-25 was no exception and it bounced around differently than the glider. None of that matters to you because you have to keep that glider right there with the tow plane. *Later we would do “low-tow,” where you put the glider below the level of the tow plane, and we would fly a box around the wake of the tow plane, but the principal is the same: keep the slack out of the tow rope. I don’t know about all Schweizer SGS 2-33 gliders but this one (and perhaps all of them) has very squishy controls. You add right bank input and a half second goes by before the glider responds. It reminded me of slow-flight in a C172 with full flaps in and barely enough power to keep her from stalling. The responsiveness of the flight controls is.. well, squishy, sloppy, slow, not as good. That’s what this aircraft is like even at normal speeds, even when being towed. I’ve done some formation flying with Jim and he taught me to find a spec or smudge or scratch on the windshield and put that spec on the aircraft you are trying to follow in formation with. “Keep it there.” Jim would say. “Keep it right there and never let it leave.” I found a black spec and put that speck right in between the 7 and the Z painted on the back of the PA-25. This exercise in good old stick and rudder skills was exhilarating! Now, like I said earlier the two aircraft react differently in the same turbulence and so it became a game of anticipating what the glider needed (as far as control inputs) to put it in the right place in relation to the tow plane at times. The tow plane would get a gust to the left and using the rudder you keep your spec right where it needs to be and muscle the glider gracefully into position using the ailerons. This experience is very engaging and very satisfying but it isn’t the best part. Once we were at 9000 feet (runway is 5901 MSL) and in position, you call release and pull that ball unhooking the tow rope and for the first time, gliding. It’s a marvelous sensation. The aggressive and almost violent experience all at once stops and you are left with a gentle, calm, quiet environment in the glider. It’s still squishy on the controls but now you aren’t wrestling an alligator with lackluster response from your aircraft. No, you feel like you have time, you have room and it doesn’t bother you much at all. Again the Glider isn’t punching through the air with a motor and so the updrafts, downdrafts, gusts of wind, from this direction or that, is a different sensation. It’s informative rather than forceful. It’s hard to describe, just know it’s not as uncomfortable at it can be in a small single engine airplane. At least that’s what it’s been like for me. Timing is a big deal in a glider and entering the pattern at a prescribed spot on an exact elevation is critical to success. You can enter the pattern further along the downwind to compensate for a lack of altitude or vice-versa but keep in mind there are no “go-arounds” in a Glider. You land or you crashland, no second chances. This is part of what drew me to gliders also. I wanted to gain that level of precision in an approach. What I experienced though did not match my expectation. Spoilers are a cool apparatus on a glider. They make you descend and there isn’t a real equivalent on a powered aircraft. The closest thing is to think of them like you do the power setting. Reduce power and descend, control speed with pitch. No spoiler input and your glide ratio is insane! So where you execute your turn onto downwind, from downwind to base and final is CRITICAL, and whatever your other situation is with airspeed and altitude you use the spoilers to compensate for. Land on a point and grind to a halt on that ski. Landing in that Schweizer SGS 2-33 was as violent a thing as I have experienced in aviation. You keep it straight with the rudder (nothing new) and keep the wings level with aileron… however you can push that stick full right and it just doesn’t do crap to keep the wing up. Add to that the idea that you steer the Schweizer SGS 2-33 onto a sort of off-ramp within moments of the grinding on that ski rocking your world, which causes the wing to dip and I don’t know what to tell ya, it seemed like chaos to me. I reportedly did just “fine”, whatever that means, but I gotta say it was a cold bucket of water in the face of the smooth patient experience of gliding that precedes it. I inquired what I was doing wrong and “Nothing, you’ll get a feeling for all that” was the unsatisfying response. Okay. We did this four times. Push the glider to the runway and tow up to 9000 feet then practice maneuvers until 7000 where we enter the downwind at this same tree. We turn to base (sharply) over a dam then turn final and lawn dart down to a spot on the runway where we grind to a halt like we crashed in the field. Success! Do it again. I tried to get any info I could about how to “read the winds” but was met with, “That’s for later, you aren’t ready to soar yet.” As I left, some of the glider pilots stopped me and inquired with grins, “What did you think?” I didn’t know how to answer. I felt disappointed and elated at the same time. I was good at some things bad at others and none of it was what I was there for, which is neither bad nor completely surprising save the $400/hour price tag. So at the end of lesson one what DID I learn? To be humble as a student, to be excited and expect much, but be open to the unexpected delights so common in aviation. I learned that becoming a super pilot is a journey one is on all their aviation life and that your “super pilot” skills are the sum of all the time you were willing to spend doing the uncomfortable learning, the tedious and often tough training. It’s also expensive. I learned that (again) too. This article was intended to describe my first foray into Gliding and attempts to describe it as I experienced it and not intended to be a training document. Often our experience as a beginner at anything is full of inaccurate perceptions and conclusions and I try to keep all those intact as I try to explain what it was like on lesson 1. I am a pilot, photographer, avid outdoorsmen, and aircraft owner. I currently have the honor of owning a backcountry Cessna 182 and a Cessna 210 for landing on pavement. I make a living as a photographer and spend that living on aviation. I was given the aviation bug by Jim Hoddenbach and we started this blog together to share our experiences in aviation with like-minded pilots. Not all pilots are Disciples of Flight and not all Disciples of Flight are pilots. If you are one, you know it, and you recognize others like you. Flight Lesson Journal: I’m Back, Baby, With a New 172! Your article exactly describes my first (and only, so far) experience in a sailplane. I was attending a crop dusting school (which is the original purpose of the PA-25 by the way) and there was a local soaring club that one of the instructors was a member of. One Saturday he invited all of the students at the Ag school to come out for a “Discovery Flight”. I was the only one who flew. It was very different from what I expected, but still a lot of fun! Why were you the only one who took the opportunity to fly? No one else wanted to try Gliding? While soaring isn’t significantly cheaper than lessons in powered planes, it appears that you found one of the more expensive commercial glider operations. If there is a non-profit club near you, that will be less expensive. It does become cheaper when you become skilled enough to stay up for a while. Pawnees are great tow planes because they have a ton of power for their size. They were originally designed as Ag planes and to carry a big hopper full of spray chemicals and climb at a fairly steep angle. They get you off the ground and up to altitude fast. Before Pawnees became popular, Citabrias, Cubs, and Cessna 150s were the most common tow planes and the climb to altitude was much more leisurely. A C150 as a tow plane? That’s fascinating… I guess I just assumed it took a bit more juice to tow those gliders up. Although when you think about a self-launching Glider with a little tiny motor on it, it makes sense that a C150 could tow a glider. Thanks for sharing that Eric. My area had a glider club and used a Cessna 152 with a 180hp engine. So that 150 might have had an upgrade for towing. The club here had a glider pilot die when his wing broke off as he was being towed up by the 152 and that put an end to glider ops in my area. Hate to have been that 152 pilot pulling the release and knowing that you are most likely killing the glider pilot to avoid being dragged down with him. Right decision 100%, but damn. It was my first summer out of the Academy and I was camping in a tent and “working” as a line boy/ student at the sailplane operator at Truckee Tahoe. One day four gentlemen showed up with a wooden glider they had just imported from Austria; It was not FAA certified aka “experimental” so wearing a parachute was mandatory. It was the plane’s very first flight and the first to fly it was an USAF pilot. Apparently the pilot must have thought he was still in his F4 Phantom because he flew in underneath a thunderhead above Mount Rose…great uplift there…and got sucked into the thunderhead. The last thing he remembered was “reaching for the canopy latch”…the plane came down in splinters but, thanks to his parachute, the pilot landed without injury except for an sprained thumb where it hit a tree stump…apparently not all disasters end this happily. Sorry about the other glider pilot. Hi, as Eric said, commercial operations are really much more expensive. Our club in Quebec charges way less as we are all volunteering. Once someone becomes a member, he has to participate to the different tasks. Our membership goes to around 1000$ a year, then about 15$/1000 feet for towing and 18$ an our for the glider. That’s it. And the club gliders are way better than SGS-2-33. At our normal operation base we have a clubhouse where our visitors can sleep for a small fee. And the historical old Quebec city is gorgeous. That field is long and large, perfect for learning. Of course, we rather invest our time on recurring members. But of our members come all the way from Texas every year for that period and enjoy this particular season. And that’s Canadian dollars, 25% off from the greenback! Non-profit is definitely the most economical. I fly in TN. Annual membership is $1000, fuel, tows, rental, and instruction all lumped into one sum ranging from $25 (1k ft) to $53 (3k ft). We also use a Pawnee as the tug. Prior to that a Maule M5 and prior to that J3’s with climb props. My story is slightly different in that my first glider flight included loops and wing-overs but I ultimately did it to overcome the fear of “what ifs” in power flight. Flying gliders led to glider and power aerobatics training including spins and upset recovery and I also became a tow pilot. Because of flying gliders Im much more intune with the aircraft, WX and a much better and safer pilot because of it. If you can find a private club the price should be less expensive, maybe much less. For instance, the club that I belong to in Arizona we don’t rent the planes, that is included in our (a very reasonable $65) monthly dues. I got my license there with about 20 hrs and spent maybe $3000 total over a year of lessons. This includes the CFIG, club, and tows. But there is a commercial operation not too far where the prices are similar to what you paid. I hope you keep up with it, once you go to one of the more sophisticated ships the experience just keeps getting better. I live in Arizona I want to get my PPL for gliders I have no interest in powered planes. Where is the club you belong to? I’m down in Phoenix the 2 places here seem to be commercial operations. First of all, thank you for reminding how good we have it in Germany when it comes to gliding (the rest of GA, not so much). I hope your experience doesn’t discourage you from flying gliders, it’s a lot of fun when you get into soaring, especially cross country. It takes quite a bit of practice to get there, though. For efficient thermaling you need to be comfortable with steep turns close to stall in turbulence (aka. thermal) to have mental capacity to spare to stay in the thermal and adjust to get into the best climb. I have about 100h in gliders (admittedly with a six year break about halfway through) and I’m just beginning to get sort of good at this. As others have said, try to find a club, aside from being less expensive, the social aspect makes gliding just so much better (everything can be made better by beer, BBQ and talking about flying 😉 ) Try to find a place with winch launches, because they’re cheap and exciting. It’s all worth it when you’re having a snack at 3000’AGL in total silence, enjoying the view and contemplating the awesomeness of a ten minute tow allowing you to fly for hours and rack up miles. Did you ever go back for more lessons? I hope you didn’t simply give up. Soaring clubs are much less expensive that commercial operations, but there doesn’t appear to be any clubs in your neighborhood. This presents a problem down the road. The skills you want to develop don’t come right away. They take time and are usually acquired by progressing through a series of SSA and FAI badges. As an example, once you have passed your checkride, you are still not ready to fly cross country. The next step is preparing to get outside of glide ratio of your home airport. This means you have to find lift to get back home. At my soaring club, new private pilots are not allowed to fly XC until they have achieved the SSA bronze badge, which requires at least a couple of 2 hour flights and demonstrated precision landings. After that, the new pilots are encouraged to fly with experienced XC pilots to gain experience before attempting to go XC themselves. The SGS2-33 is an old trainer. Not that it is a bad trainer, it’s just not a modern glider. My club has three ASK-21 gliders as trainers. They are much closer to what glider pilots will fly after they transition to other gliders. The responsiveness and performance are much better. If you have some flexibility in your schedule and can travel, maybe that would lead to a better experience for you. Lastly, even though you are an experienced power pilot, learning to interpret the winds and wx conditions that you were hoping to learn takes a lot of hours in the air in those conditions. In other words, it’s not just an add on. You actually have to spend time struggling to learn the art of soaring. In a way, it’s like someone who has done a lot of powered boating, but decides to learn to sail. They have conceived notions, but they don’t really know what they don’t know. When they try to read the wind and attempt to tack or jibe, they often find that they can’t accomplish what they need to until they have had sufficient practice. Soaring is much the same, whether it is thermal soaring, ridge soaring, or wave soaring. Each has it’s learning curve. I hope you continue to pursue the sport. BTW, I don’t think getting a glider rating ever made anyone a “super pilot,” but every aviation experience adds to a pilot’s experience. I do know a number of super pilots, with accomplishments in many areas of aviation, who were drawn to soaring and have made significant accomplishments in that arena, as well. I am still working on the rating. Winter set in here and the Glider school shut down for the season. I plan to finish it off this May. My goal is to learn the skills required to fly XC and not “just” to get the rating. I find the whole experience fascinating and remarkably different than powered flight. Wait until you get into something nice and not a 2-33. I don’t even mean high $ super slippery gliders, just something that actually has nice control feel and harmony, like a Ka-6. Or do a 140 kt low approach and aerobatics in an ASK-21. Only nice thing I can say is that I’d rather be flying a 2-33 than on the ground. What a delightful story… I love it. You capture the unexpected as well as the hoped-for. I’d never flown a 2-33 until last week, and boy howdy, those controls do lag the inputs by quite a bit. I pitched and rolled all over the place on tow… very humbling. Off tow she was a different beast, and thermalled the best among all of the two-place gliders in the gaggle. I’ll echo the folks here who recommend clubs as cheaper options; of course commercial operations have their strong points as well (primarily in terms of being able to get the time/airframe/instructor you want). The ASK-21 and the Grob 103 are slipperier two-place ships that are honest in their quick responses; earlier metal two-place ships like the Schweizer 2-33 and 2-32 demand different timing and larger inputs on tow but settle down in flight. Either way, take your time, enjoy the experiences, and milk those glider flights for all of the lessons you can take away from them! Was looking for articles on Glider Add ons for my PPL and saw this and enjoyed the read. I am from the US but doing my training in Germany while stationed here. Joined an Aeroclub and will literally live at the airport on the weekends. Gonna try to earn it while here but I gather I will have to learn a bit of German as well. Did my first flight yesterday and your last paragraph summed up my experience. Good introduction to the sport. I got my airplane private in college, later add on private glider, many years later upgraded that to commercial. (It was a terrific training experience.) I’m a member of a club on the MN-WI border, which gives comradeship and certainly does decrease costs. While flatland thermals are limited–getting to 10k feet is a very unusual day–the open land is beautiful, especially when dotted by cumului clouds promising lift. Plus there are lots of places to land out and not too many cities in the way. To stay up matching your wits with nature is always fun, and it’s possible to do a flight of several hours when conditions are booming. Gliders may not be “practical”, but they sure are fun. Great training machines too; a pilot who starts out in one will quickly learn how to read the ground, keep track of the wind, and not fear losing an engine. Landings get pretty precise too, and the badges are a nice series of goals to work towards. I got my glider certificate in a motor glider. It was nice because you don’t waste any time waiting on rows or winch launches. It’s pretty much an airplane that you shut off engine at altitude. Did it in 2 days in Florida in 2016. $1700 total! May I suggest finding a club? Not only will you reap a huge financial advantage but the knowledge you will gain by hanging out and soaring with experienced pilots will take you further than you can imagine and much further than most people ever do on their own. I’m a power pilot just like you, (also a tow pilot for our club) and soaring definitely took my flying enjoyment to a whole new level. Trust me..once you soar your first xc you’ll be hooked forever. That 2-33 is your problem. Learning gliding in one of them is like learning auto racing on a Soviet tractor from the 1930s. Walk away. Find a school that uses actual sailplanes. Different type of 1st flight, Northampton West Australia 1968. DH Chipmunk tow plane_ WW2 Spitfire tow pilot. 10 minutes into the introductory flight I was asked if I would like to try the controls –super sensitive — I became one with plane. My mind felt the edge of the thermal touch the right wingtip as I turned into the rising air and the turbulence movedineard to the fuselage anon out to the left wingtip. I looked down at that right hand resting on my knee to steady the thumb and next two fingers which we’re guiding the plane. So THIS was “FLYING” finally after 4 trips around the world on airplanes. That day I FLEW!!!! For 20 minutes – I centered us in the thermal and my mind flew .